NCEL Premier Division club Clipstone FC have appointed Paul Rockley as assistant manager to manager Billy Fox. Paul, who is a UEFA B licensed coach, was previously first team coach at Eastwood Community FC and was also part of the coaching set-up at Mansfield Town Youth Academy. 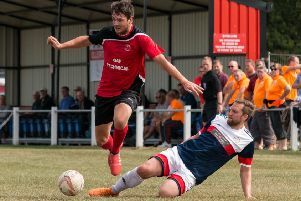 “I am honoured to join Clipstone - a club with a proud history and passionate fans, which I was proud to witness at the recent Notts Senior Cup final,” he said. “I am looking forward to working with Billy and the first team squad, building on from last season and continuing to push the attacking playing philosophy that Billy and I share. “Together we will be establishing and developing the Mansfield links in the local community. Clipstone finished 13th in the Premier Division last season and were pipped on penalties by Basford United in the Notts FA Senior Cup final.